Consider this: one in three Americans gain their first work experience in a restaurant and three fourths of restaurant employees believe they have the opportunity for career advancement in the industry. The Who Works in the U.S. Restaurant Industry report by the National Restaurant Association Educational Foundation shows that first jobs in the restaurant sector help people learn and develop crucial skills and attributes necessary to be successful in the workforce – regardless of industry. 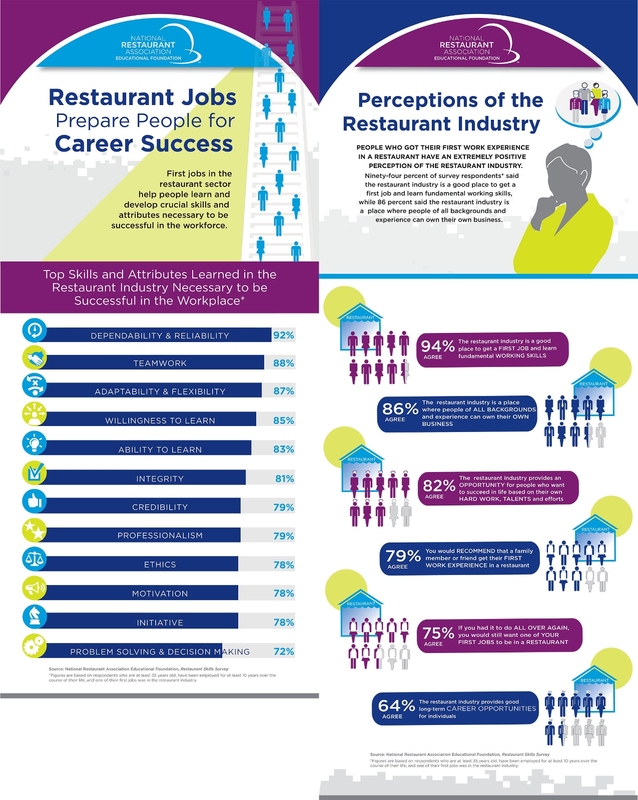 Research completed by the National Restaurant Association Educational Foundation shows that first jobs in the restaurant sector help people learn and develop crucial skills and attributes necessary to be successful in the workforce. According to information from the National Restaurant Association, the restaurant industry remains the nation’s second-largest private sector employer this year, with a workforce of 14.4 million. Jobs in the industry represent an excellent way for people to gain valuable career-building knowledge and skills, as well as explore the diverse array of career opportunities in food service. For more information, see the infographic. As the philanthropic foundation of the National Restaurant Association, the NRAEF exists to enhance the restaurant industry’s service to the public through education, community engagement and promotion of career opportunities. The NRAEF works to attract, develop and retain a career-oriented professional workforce for the restaurant industry. In 2016, the restaurant and foodservice industry is projected to provide a record 14.4 million jobs, making it the nation’s second largest private sector employer. For more information on the NRAEF, visit ChooseRestaurants.org.